Golden rice: Is it vaporware? For thousands of years, humans have been genetically enhancing other organisms through the practice of selective breeding for better crops and livestock. Selective breeding is the traditional method for improving crops and livestock, such as increasing disease resistance or milk yield. Traditionally this was done by carefully choosing parents for breeding that show the required characteristics. More recently it's been possible to implant particular genes using genetic engineering. Genetic engineering is a faster way, which transplants genes for a desired characteristic into an organism. However, genetic engineering offers many potential benefits. Both these techniques depend on there being change and variation in the genetic material – which is caused by mutations. Look around you: the seedless watermelons, sweet corn, fleshy sweet potatoes at the supermarket, the purebred dogs at the park, and your neighbor's prize rosebush are all examples of how humans have selectively enhanced desirable traits in other living things using genetic engineering. Similarly, the “golden rice” the next genetically modified food which is available broadly to farmers and consumers, if it is successfully developed into rice varieties, approved by national regulators, and shown to improve vitamin A status in community conditions. If Golden Rice is found to be safe and efficacious, a sustainable delivery program will ensure that Golden Rice is acceptable and accessible to those most in need. Thus, Golden rice is a genetically modified rice crop that produces vitamin A. In this article, we will learn about how golden rice is made and how it can be used to prevent blindness and death in the developing world. A genetically modified organism (GMO) is any organism whose DNA has been altered using genetic engineering techniques. GMOs are used in research and to produce food crops which are much beneficial than the normal ones and are disease-, pest-, and herbicide-resistant, as well as crops that have increased nutritional value. Although there is still controversy over whether they should be produced and sold. Many groups oppose the production of GMO food crops because of fears over human health and damage to the environment. In many areas of the world, rice is a staple food for half of the humanity, especially for the poorest people. Particularly, in Asia it is the main source of dietary energy for many people. Yet, rice is a poor source of some vitamins and minerals, e.g. unlike certain other crops it does not contain any beta-carotene (provitamin A). Therefore people who rely on rice as their main food source are at risk of vitamin A deficiency. Golden Rice is a type of rice that contains beneficial amounts of beta-carotene, which is used by the human body to make vitamin A. Beta-carotene gives Golden Rice its yellow color. Many fruits and vegetables, such as papaya and carrots, also get their color from beta-carotene. 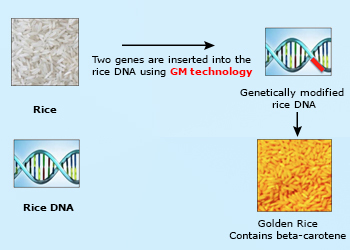 Golden Rice was bred using a combination of genetic modification and other breeding methods. It contains genes from maize and other sources that together produce beta-carotene. Golden Rice is expected to taste the same as other rice, be cooked in the same way, and have the same eating quality of other popular rice varieties. This risk is biggest for pregnant and lactating women as well as for young children. The main consequences of vitamin A deficiency are (i) eye problems that can lead to complete blindness and (ii) a higher susceptibility to infectious diseases that are often deadly. Since these people often do not have access to a variety of food sources, they suffer from many nutritional deficiencies. Golden rice has the potential to save many lives and prevent blindness in children throughout the world, although it has not been widely adopted yet. According to research published in the American Journal of Clinical Nutrition, one cup of Golden Rice could supply half of the vitamin A needed every day. Golden Rice could be used in combination with existing ways of overcoming vitamin A deficiency through diet, fortification, and supplements. Researchers have already found that the body turns more than 25% of the beta-carotene in Golden Rice into vitamin A, a better conversion rate than for many green, leafy vegetables. Let us read on to know the science behind the miraculous food – golden rice. Invention: Inventors of Golden Rice were Ingo Potrykus, Professor emeritus of the Institute for Plant Sciences of the Swiss Federal Institute of Technology (ETH, Zurich), and Professor Peter Beyer, of the Centre for Applied Biosciences, University of Freiburg, Germany(Ye et al 2002). Golden Rice has been developed as a potential new food-based approach to improve vitamin A status. The most harmful micronutrient deficiencies in the world is due to the low dietary intake of vitamin A, iodine, iron and zinc. Vitamin A deficiency (VAD) is most common among the poor whose diets are mainly based on rice or other carbohydrate-rich, micronutrient-poor calorie sources. Vitamin A deficiency can be particularly severe in countries where the staple food contains no forms of vitamin A and other nutritious food is scarce, unavailable, or too expensive. Rice is an affordable and filling food, yet it contains no source of vitamin A. More than 90 million children in Southeast Asia suffer from vitamin A deficiency, more than in any other region. Rice does not contain any β-carotene (provitamin A), which their body could then convert into vitamin A. Dependence on rice as the predominant food source, therefore, necessarily leads to VAD, most severely affecting small children and pregnant women. In 2012 the World Health Organization reported that about 250 million preschool children are affected by VAD, and that providing those children with vitamin A could prevent about a third of all under-five deaths, which amounts to up to 2.7 million children that could be saved from dying unnecessarily. So, Golden rice hence designed through genetic engineering and is a variety of rice (Oryza sativa) to biosynthesize beta-carotene (Beta-carotene can be found in fruits, vegetables, and whole grains. It can also be made in a laboratory. Beta-carotene is used to decrease asthma symptoms caused by exercise; to prevent certain cancers, heart disease, cataracts, and age related macular degeneration (AMD); and to treat Alzheimer’s disease, depression, epilepsy, headache, heartburn, high blood pressure, infertility, Parkinson’s disease, rheumatoid arthritis, schizophrenia, and skin disorders including psoriasis and vitiligo), a precursor of vitamin A, in the edible parts of rice. It is intended to produce a fortified food to be grown and consumed in areas with a shortage of dietary vitamin A, a deficiency which is estimated to kill 670,000 children under the age of 5 each year. Rice is a staple food crop for over half of the world's population, making up 30-72% of the energy intake for people in Asian countries, making it the perfect crop for targeting vitamin deficiencies. Golden rice was created by transforming rice with two beta-carotene biosynthesis genes: psy (phytoene synthase) from daffodil (Narcissus pseudonarcissus) crtI (carotene desaturase) from the soil bacterium Erwinia uredovora. How was Golden rice made? 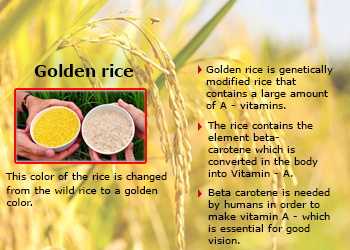 Golden rice differs from its parental strain by the addition of beta-carotene biosynthesis genes. It takes a lot of genes to make beta carotene and if any one of these genes doesn't work, then no beta carotene gets made. When scientists looked at rice, they found that rice didn't make beta carotene in the rice kernel because many key genes were off there. They decided to add back genes to get the process working in this part of the rice plant. Sort of like gene therapy for the rice plant. In the latest version of golden rice, scientists connected a corn gene and a bacterial gene to a piece of DNA that keeps these genes turned on in the kernel. The scientists then got these genes into the rice using a plant virus. 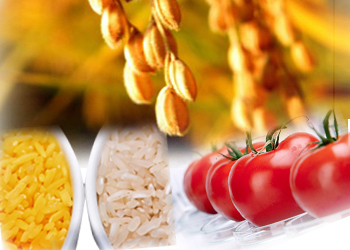 Golden Rice technology is based on the simple principle that rice plants possess the whole machinery to synthesize β-carotene, and while this machinery is fully active in leaves, parts of it are turned off in the grain. By adding only two genes, a plant phytoene synthase (psy) and a bacterial phytoene desaturase (crt I), the pathway is turned back on and β-carotene consequently accumulates in the grain. In 2005, Golden Rice 2 was announced, which produces up to 23 times more beta-carotene than the original golden rice. To receive the USDA’s Recommended Dietary Allowance (RDA), it is estimated that 144 g of the high-yielding strain would have to be eaten. Bioavailability of the carotene from golden rice has been confirmed and found to be an effective source of vitamin A for humans. Gene transfer technology is simply a sophisticated version of a cut-and-paste operation. 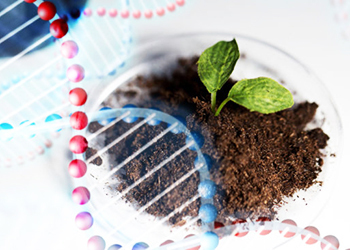 Once the desired gene is identified in the native organism's genome, it can be cut out, transferred to the target plant, and pasted into its genome. Once the new gene has been introduced, the plant can be bred to create a new strain that passes the gene from generation to generation, the same principle applied for the expression of more vitamin A in golden rice grain. Technology now allows us to transfer genes between organisms. The type of genetic augmentation that creates the most concern goes a step beyond selective breeding, however. For example, the tomato plant's beetle resistance relies on a gene from a bacterium (Bacillus thuringiensis), which scientists inserted into the tomato plant's genome. This gene, called cry1Ac, encodes a protein that is poisonous to certain types of insects, including the beetle. Not very scary as far as one can tell especially when compared to millions of deaths. We need to divide the safety concerns into two broad categories. One has to do with eating the stuff. The other has to do with what this rice will do to the environment. First off, there is nothing dangerous about the DNA per se. We eat DNA everyday and it all gets digested and used for energy or to build up our own DNA. Eating golden rice isn't any worse than eating rice and corn from a DNA perspective. There is a slight chance that someone who is allergic to corn might be allergic to this rice too. This would only happen if someone happens to be allergic to corn because of that certain gene. Another possible danger is that people may get too much vitamin A from golden rice. We know that too much vitamin A can cause problems like birth defects and osteoporosis. But these things happen if you get too much preformed vitamin A that comes from supplements or some meats. There are no cases seen in any studies that say that too much beta carotene is toxic. The body uses what it needs and excretes most of the rest. (Sometimes with way too much beta carotene people can end up with an orangish color to their skin but no one has shown that this has any adverse health effects.) So it is extremely unlikely that people will overdose on golden rice. The other major safety concerns are environmental. I don't mean that the rice itself will take over the valleys of China or Bangladesh. This isn't very likely at all. The major concern seems to be that the DNA will move into wild strains of rice. Or that it will leap to different species altogether. The fear then is that two genes that are involved in making beta carotene in the endosperm of rice could move into these plants. Even if this happened, it wouldn't create a super weed like with some RoundUp ready plants. Basically plants that happen not to make beta carotene for the same reason that rice doesn't in its kernel might start to make beta carotene. Particularly, every crop we eat might have been subjected to hundreds of years of genetic modification by farmers and scientist in search of selective desirable traits. 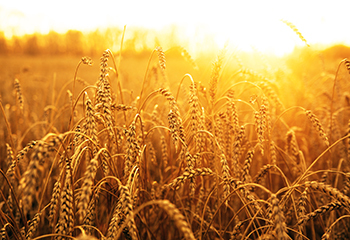 Hybrid strains and selective breeding have contributed immeasurably to farm productivity during this time. Over the past 30 years however, genetic engineering has been revolutionized. While before, a farmer wanting to develop a frost resistant tomato would be able to breed towards one only if the necessary genes were available somewhere in tomatoes or a near relative to tomatoes, modern biological engineering techniques overcome such restrictions and limitations. Genetic traits from outside a species’ gene pool (the stock of different genes in an interbreeding population.) , in the tomato’s case from an arctic fish, can be spliced into the organism to create an entirely different species, a transgenic organism with the typical traits of a tomato and frost resistance from a fish. This incredible innovation of miraculous food will ensure that any approved Golden Rice varieties will grow just like other rice crops, with conventional and comparable yields and pest-free resistant, and with the same environmental impacts. It is expected that Golden Rice will be planted, harvested, threshed, and milled like current rice varieties. 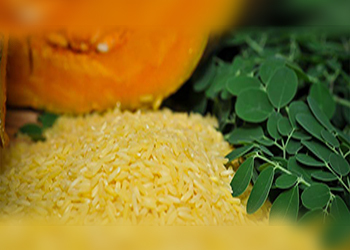 All Golden Rice research is conducted according to national biosafety regulations and additional biosafety conditions established by the institutes carrying out the research.